The eye and ear are highly complex special senses, and both make their initial appearances early in development - before the end of the 1st month of development. The eye is derived from ectoderm and mesoderm, while the ear is derived from all three germ layers - ectoderm, mesoderm, and endoderm. Both senses become partially functional before birth: the fetus is startled by a loud noise or a bright light from about the 6th months onwards. But maturation continues after birth, especially in the neural mechanisms involved in interpreting visual and auditory stimuli. Development of the eye has been studied in detail in several species, and much of our knowledge about embryonic mechanisms has come from these studies. For example, much of the early work on induction (the influence of one region of the embryo on the development of a nearby region) was carried out on the embryonic eye, particularly the relationship between the optic vesicle and the lens placode. Induction of lens development by the optic vesicle appears to be a means of co-ordinating development - it ensures that the lens is formed in the right place at the right time. If this process fails, the eye fails completely to develop, a condition known as anophthalmia. The importance of parallel arrays of microtubules in the folding of embryonic cell layers was first noticed in an electronmicroscopic study of the invaginating lens placode. Note that the neural retina, which is derived from the indented region of the optic vesicle, is really a modified part of the brain wall. Thus, the optic nerve connects two different parts of the brain, and perhaps therefore should be considered a tract rather than a nerve. Once the optic cup and lens vesicle have been formed, the adjacent mesenchyme condenses to form the outer coats of the eyeball - the sclera and choroid - and contributes to the transparent cornea at the front of the eye. For additional drawings of eye development click here. The ear develops alongside the embryonic hindbrain - note also its position in relation to the 1st and 2nd pharyngeal arches. The outer ear develops from the 1st pharyngeal cleft - which forms the external auditory meatus - and six small swellings around the cleft which combine to form the auricle. The middle ear cavity develops from the tip of the 1st pouch, and retains its connection with the pharynx (the pharyngotympanic tube). Before birth, the middle ear cavity is filled with fluid, but after birth the fluid is replaced by air. 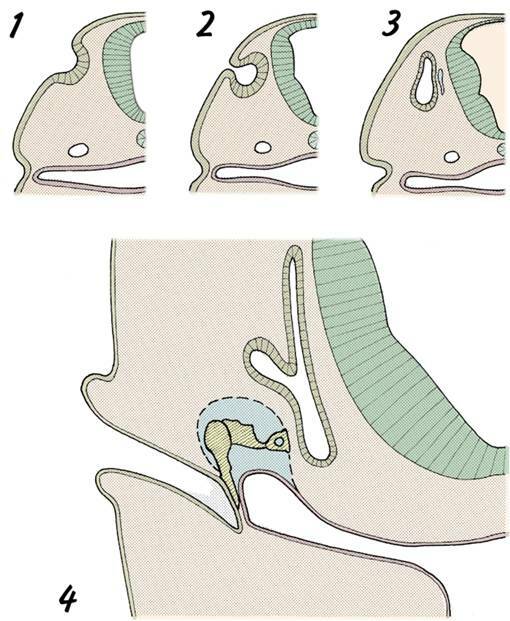 The ossicles of the ear develop in 1st and 2nd arch mesenchyme alongside the 1st pouch. Later, the middle ear cavity enlarges and 'engulfs' the ossicles, so that they form a bridge across the cavity. The inner ear first appears as a spherical otic vesicle, formed by the invagination of the ectodermal otic placode. The different components of the inner ear - ie: the semicircular canals, ultricle, saccule, and cochlea - are then fashioned by modelling of the otic vesicle. Note the formation of the tympanic membrane from all three germ layers. How is the optic cup formed? 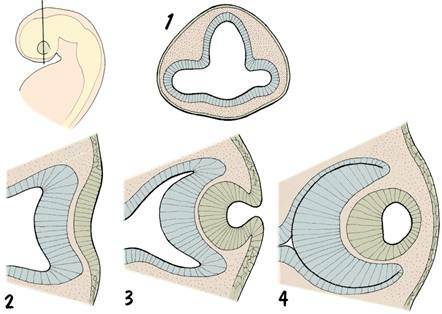 Give an embryological origin of the iris. From which germ layer are the muscle fibres in the iris delivered? What is believed to be the primary fault in cyclopia? What is the embryological origin of the ossicle of the ear? Describe development of the tympanic mambrane. If a mother becomes infected with Rubella virus during the first trimester, there is an increased risk of her child being born deaf. Which part of the developing ear is most commonly affected by this virus? Is the ear sometimes involved in the first arch syndrome?